Duelosaur Island is built around a clever hand-management mechanism. Each card in the game serves three potential purposes. They contain the DNA sequences for dinosaurs you could create, the blueprints for attractions you can build, and certain actions that you can take by discarding them. Do you create the dinosaur on the top of the card to attract guests to your park? Or do you build the attraction on the bottom of the card, which can add to a player’s hand-limit, income, and end-game victory points? Or do you discard the card to combine DNA towards creating another dinosaur? Duelosaur Island comes with five new full-color “DNA dice”. 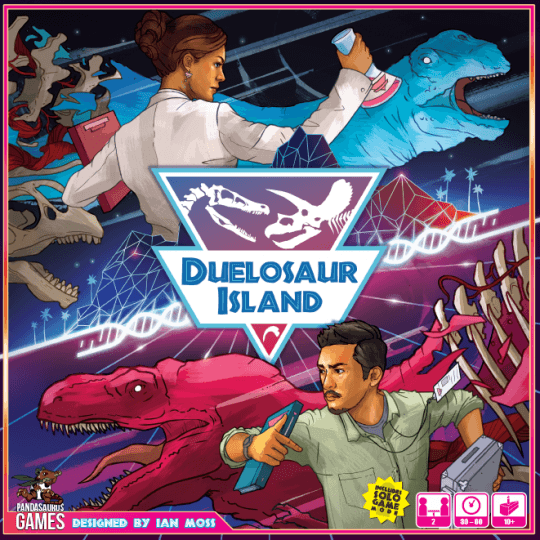 You can mix and match dice between Dinosaur Island and Duelosaur Island for even more variability in both games, such as the new security symbol that can appear on dice to upgrade your security level instantly!